A mental health or substance use crisis can occur for many reasons. Sometimes it can happen for no clear reason at all. Seek help if you are concerned about yourself or a loved one. Call your local crisis number to speak to a counselor. They can guide you. It’s available at no cost 24 hours a day. 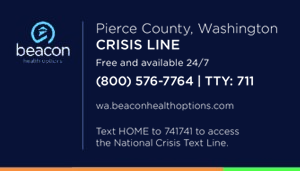 Beacon Health Options can help you get care for mental health and substance use issues. Click here to see a list of resources, such as behavioral health care, transportation, and housing. Within available resources and when medical necessity is met, Beacon may give more outpatient or residential substance use disorder and/or mental health services. Services funded through substance use block grant are available to pregnant and post-partum women as a priority population. Click here to view what is covered in the block grant plan for Southwest, North Central, and Pierce County. To ask about these services, call Beacon at 855-228-6502. 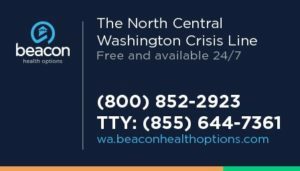 If you don’t have insurance or have it but can’t pay co-pays, deductibles, or spend downs for opioid addiction, Beacon may be able to help. 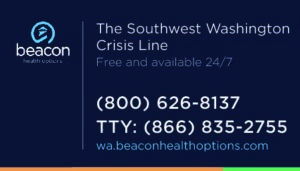 Beacon received funding through Washington State’s Targeted Response for Opioid Treatment Grant given by the Substance Abuse and Mental Health Services Administration in 2017. Requirements for help include agreeing to take part in Case Management Services with Beacon and showing proof of earnings. Priority is based, in part, on participants meeting federal poverty measures, and their past treatment. Program administration is based on temporary and limited funding; ongoing treatment and support may not be given through this grant. Southwest Washington (Clark, Skamania, and Klickitat Counties), please contact the Ombuds Melanie Maiorino at 866-666-5070 or via email at swwaombuds@gmail.com. North Central Washington (Chelan, Douglas, Grant, and Okanogan Counties), please contact the Ombuds Ken Sterner at 800-572-4459 or via email at sternk@dshs.wa.gov. Pierce County, please contact the Ombuds Michelle Tinkler at 800-531-0508 or via email at michelle@tacid.org or Ombuds Princene Johnson at 800-531-0508 or via email at princene@tacid.org.